We are pleased to offer you a wide selection of artistic and educational gift items. 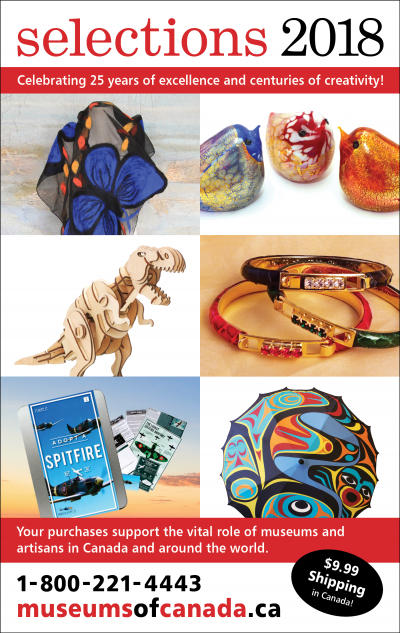 Your purchases support the vital role of Canadian non-profit museums, and have a real impact on the lives of artisans from across Canada and around the world. Your purchases make a difference! For 25 yearss, Selections has offered unique and wonderful products. We have printed more than 15 million copies of our unique offerings and worked with museums, galleries and artisans. Many of our products are made exclusively for Selections. A portion of all our proceeds go to support the Canadian Museum Association, the national organization for the advancement of the Canadian museum sector. The CMA has nearly 2,000 members, including non-profit museums, art galleries, science centres, aquaria, archives, sport halls-of-fame, artist-run centres, zoos and historic sites across Canada. They range from large metropolitan galleries to small community museums. All are dedicated to preserving and presenting Canada's cultural heritage to the public. Selections has worked with artisans from around the globe. The products that we offer have helped developing communities. The artisans have an opportunity to carry on traditions and showcase their skills while ensuring a fair income and a safe work environment for the artisan. Many of our products are Fair Trade.